St Bees is an ancient church complete with a famous dead crusader and a legendary Irish princess, but with a desire today to bring the Gospel to our community. The vicar is Cliff Swartz, an American who with his wife Katie moved to England in 1997. They’ve lived and worked in Cambridge and East Yorkshire, and had some years back in the States for boarding school ministry in New England and parish ministry in Manhattan. Each time they’ve moved, God has blessed them with a child, which means five children over their seventeen years of married life. They are now never going to move again. Cliff’s wife Katie is the one who would really give all the wisdom to the trainee, but don’t tell the wardens. Cliff is vicar of the Priory Church in St Bees, which is moving along from middle of the road gently declining Anglican village church, by introducing a ministry with a greater focus on teaching the Bible to all ages and in all settings, and so it is gently growing and reaching its community, by God’s grace. The parish has been excited to have its first ministry trainee this past year. He has been encouraged to stay for the optional second year. We hope to add a second ministry trainee, and would prefer a young woman, but the right person is more important. Twenty pupils went along to a Gloddaeth Holidays camp (glod.co.uk) this summer from St Bees School, and the youth work in the parish is getting off the ground, so there is lots to do in that area. We are small enough to craft an experience to meet the gifts of the trainee, and mix up work at the Priory Church, St Bees School and the North West Partnership which offers the weekly training course. Housing and term time meals are provided in staff housing at St Bees School. A grant is made available for living expenses along with ministry expenses and training expenses paid by the church council. We are a small outfit, where a broad experience and a safe environment to learn and grow can be achieved. We live in a beautiful, but remote, place, and so insist on the participation of ministry trainees both in the North West Partnership scheme as well as the Living Room, which is the 20-something Christian group run with a church in partnership with us here. And you’ll be home for Christmas. We have a Vicarage first – a Ministry Trainee recruited through The Vicar’s Wife! Our newest attic dweller moves in this coming Saturday after a whistle stop application-interview-appointment process following my blogpost advertising the vacancy only a couple of weeks ago. The children’s worker at our new lodger’s home church is a reader of the blog and when she saw the ad, pointed him in our direction. It will be great to have a full house again and we are looking forward to getting to know BytheSea (as the Joker has titled him) in the coming weeks. We are grateful to God for such a swift answer to prayer. The lovely Radiohead left our attic yesterday. He’s headed back home and is busy applying for jobs in teaching. 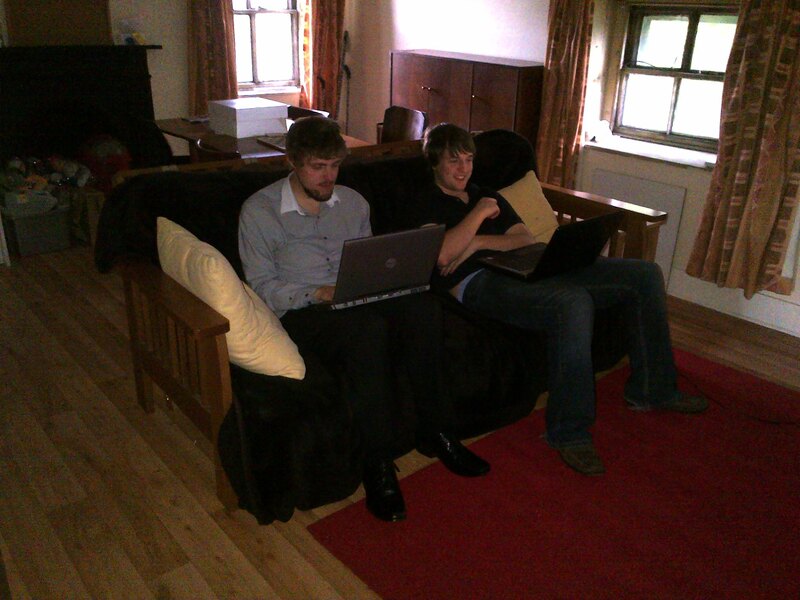 So now there’s a space in the Vicarage for a new Ministry Trainee. We’re looking for someone who has a passion for people and for seeing God at work in their lives. You don’t have to be considering ordination, although the Diocesan Director of Ordinands would be very happy to see you and two of our previous attic dwellers have taken that path, and Red, who’s still here, is aiming for a dog collar. Perhaps you’d like some time to think about ministry life, or just want to serve in a church before going into something else. 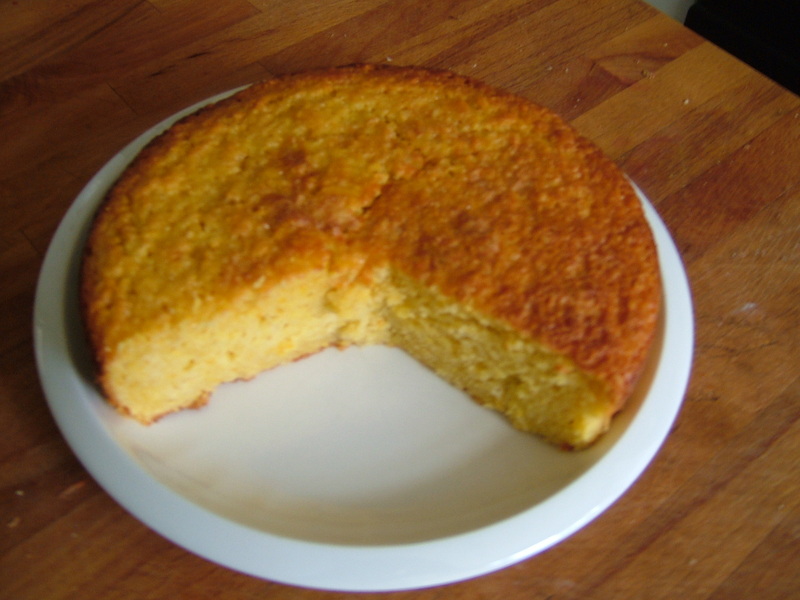 A fondness for cake and the ability to negotiate your way around a cluttered family home might be an advantage. And you should know that we have a cat, a fish and a rodent. But you don’t have to have the rodent sit on your head if you don’t want to. If it’s not for you, maybe there’s someone you know who might be up for Vicarage life. Do please point them in our direction. Working hard. Or possibly playing games. There’s time for both. Did I mention I’d FINISHED THE BOOK? It’s with my editor and I just have to sort out the blurb for the back cover and book catalogues and take a trip to Nottingham to enthuse at the sales reps.
We have anew Ministry Trainee, Red, who has joined Radiohead in the attic. He has a trumpet and is proving handy with a teatowel. Radiohead has decided to leave at the end of August so an attic space will be available if you or someone you know would like to join us in the mess for a year or two to learn about ministry and the consumption of cake. I have lots of shiny new books to review. We saw Gone the other day, who was walking with crutches (he was assaulted recently and had to have an operation on his hip), was a bit vague about whether he’d been evicted (we think he hasn’t) and was carrying a bottle of Frosty Jack in his pocket. I am typing this with a sleeping baby on my knee. His mum is asleep in our spare room. I have just managed to adjust him so I can type with both hands. How do you go about training a couple of Christian lads who are thinking about possible ordination? We have a programme that includes a bible training course and lots of practical experience in church life. But sometimes the unplanned events are the ones that help to give the deepest insight into Christian ministry. 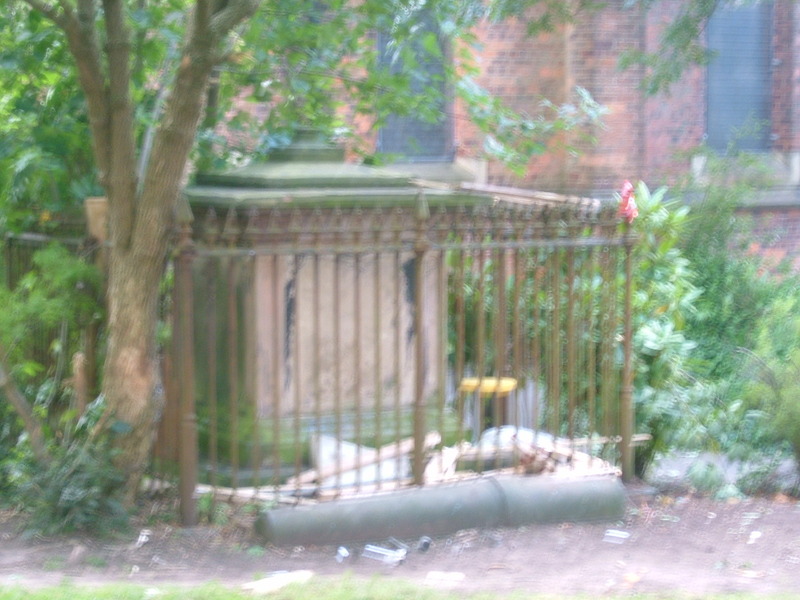 And here we have a picture of a fenced tomb outside the church. On Saturday morning we had a churchyard working party. Local kids joined adults as we swept leaves and cleared bushes to make everything look tidier. By Sunday afternoon a bunch of children (including some of those who’d helped tidy up) had dragged a bunch of stuff they’d found in some bins inside the fence round this tomb and were dancing on top of it. The rubbish collection included bits of wood, a couple of old chairs and some plastic ride-on toys. The black plastic chair that was on top of the tomb had been cleared away by the time I took this picture. The kids weren’t very receptive to my request that they clear up, but Radiohead and Sweet Tooth headed out to sort things out and managed to get the kids to help tidy up the mess they’d made. It took a while and some swearing (and not from the grown-ups), mind. Afterwards the new MTs were able to spend some time chatting with parishioners who been watching the hooha (and helping to persuade the kids to take responsibility). Not necessarily what you’d choose for a training opportunity, but valuable all the same. And quite a way to meet the neighbours. 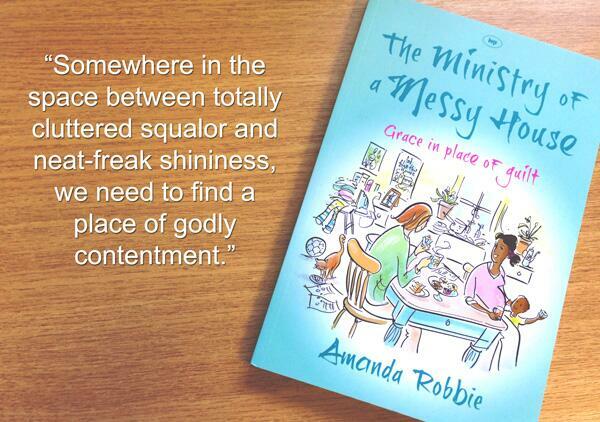 Thinking about getting in touch about our Ministry Trainee scheme? The scheme is going to be even better next year, as we’ve just had the go-ahead to renovate the chilly attic where our Ministry Trainees are housed. The excellent local Walter Stanley Trust, which supports ministry in our deanery, has agreed to lend us the money for the renovations so we can go ahead and make the space more comfortable. We will also be able to house two MTs, instead of just the one, in a comfortable apartment with two bedrooms, a shower room and a living/dining room with kitchenette. And it will have central heating! Rocky and Happy have bravely lodged here in more austere conditions, but we pray that these changes will enable us to train more folk for ministry for the benefit of the kingdom of God in this parish and beyond. The local paper has recently featured an article about the renovation project – with a couple of good pics of the Vicarage and the Vicar.